This is the first blog entry for our trip to France in 2018.🇫🇷 We are looking forward to returning to our home away from home! Back to Saint-Malo. This entry will tell the story of our first three weeks in France with our friends from Illinois. Future entries will discuss the rest our stay in France which lasts until September 13, 2018. FIFA U-20 Woman’s World Cup in France. Today we had an interesting experience using Skype. A month or two ago we had applied to be volunteers at the FIFA U-20 Woman’s World Cup which will be held in France in 2018. The matches will be held in Brittany, our region in France, during August 2018. Some of the preliminary matches will be held in Saint-Malo, our town in France. So, we decided to try to volunteer for the events. We will be in Saint-Malo in June, July and August this year so the timing is good. We initially submitted written applications through the FIFA Volunteer Portal website. The applications resulted in interviews which were held on Wednesday April 11. The interviews were done via Skype. A very nice person at FIFA did a lot of adjusting of his schedule to do the interviews with us. Sandy did the first interview at 8h00. I had the second interview at 8h30. Hopefully we will be accepted as volunteers. The biggest obstacle to our getting selected is the requirement for “intermediate French language proficiency” which we may not possess. Anyway it has been a good experience and we will hope for the best. We are scheduled to fly to France in the middle of May 2018. We will be traveling with our friends Bill and Caron B. Bill and Phil have been friends since college (many decades ago). Caron’s father was in the US military and she was born in France. They left France when she was a small child and she has not been back. So, Bill and Caron are going with us to France. We will spend a week or so in Paris, then travel to Strasbourg for three days, then on to Saint-Malo. They will be spending around three weeks in France. We do plan a Normandy D-Day site tour as part of our agenda. We and the B’s have been planning this trip for quite a while. We purchased our Air France tickets in November of 2017. We will be traveling to their town in the next week or so to finalize the plans. We are leaving for France today. We will arrive in Paris around 8h00 on Thursday the 17th. Our friends will not be flying with us. Here is the story. Bill B developed a leg problem about 10 days ago. It caused him quite a bit of pain and discomfort. It also seemed to baffle the doctors for a while. The end result was that Bill’s doctor could not give him any guarantees about his ability to travel or about how he would feel in France. So, Caron B came to the tough decision to continue her plans for France but without Bill. Caron arranged for her cousin Donna to accompany her on the trip. The airfare was a problem because Bill’s ticket could not be given to Donna. She would have to purchase a new ticket. Only 7 days before the flight the Air France ticket price was $3,200. So, Caron cancelled her and Bill’s Air France tickets and got their money back because they had insurance. Caron and Donna ended up with very reasonably priced tickets with Iceland Air and WOW. They would fly via Reykjavik Iceland to and from Paris. They would arrive in Paris just about 4 hours after Phil and Sandy. All the rest of the planned arrangements, hotels, tours and trains, would be okay with Donna substituting for Bill. Our Air France flight arrived almost an hour early. As usual with a real early arrival our gate was not clear. At Paris Charles De Gaulle Airport (CDG) when this happens they park your plane a good distance from the terminal, place a staircase by the plane, have you exit the plane and descend to the tarmac using the staircase, and then board a bus that takes you to the terminal. People with a lot of carry on baggage had some difficulty. More fun after an 8 hour flight. With our plane landing early we headed to the passport control area. Here we queued with passengers from other flights for about 45 minutes before getting passed through to get our luggage. Luggage was easy, it was waiting for us when we arrived at baggage pick up. Our plan had been to take the regional train (RER B) into Paris, drop off our luggage at the hotel and then return to CDG to meet Caron and Donna as they exited baggage pick up at their terminal. But with the long delay at passport control we had to give up that plan. So now we had about 2 and a half hours until their plane arrived. We took the CDG shuttle called CDGVAL (it is a light rail train between the terminals) to Terminal 3. First we bought 20 tickets which would be good on the Paris metro and Paris buses. Then we walked to the Hilton Hotel which is only about 100 meters from Terminal 3. The restaurant was closed, but we were about to get breakfast at the bar. So our first croissants were eaten at the bar in the Hilton. We stayed a little over an hour at the bar. They had comfortable chairs, it was quiet, and their restrooms were free, close to the bar, and clean. Then we took the CDGVAL to Terminal 1 and waited for Donna and Caron to arrive. They were on time and had little trouble getting their luggage. The good thing about flying through Reykjavik was they went through European Union passport control there instead of Paris. We then took the CDGVAL back to Terminal 3 and rode the RER B train. The trip was direct, with no stops and only took about 30 minutes. We arrived at the Paris Gare du Nord without trouble. Our next step was to take the number 26 or number 43 bus to the hotel. We got lucky and a 26 bus was at the stop. Using the tickets we had already purchased we took the bus to the hotel. The trip was only about 10 minutes. Checking into the hotel was easy. Around 18h00 we headed out to visit the Galeries Lafayette Haussmann which was about a 15 walk from the hotel. Well a couple of wrong turns caused us to walk a bit extra, but no harm. After all it is still Paris! After the Galeries Lafayette we walked back toward the hotel. We ate at a nice restaurant called Abradavio which was only a couple of blocks from the hotel. Sandy and I recognized the waiter from our visit here a couple of years ago. A very nice man. If you are looking for pictures of France you will have to click on this link 2018-France. Our 2018-France album at the Flickr website will open in a new window. We have not sorted all the photos to put in the blog since there are almost 750 pictures currently out there. Maybe we’ll get around to it later. Why a trip to Bourron-Marlotte? Well Caron B was born in France. Her father was in the US military at the time. She and her parents lived in France for a little while before returning to the USA. Bourron-Marlotte was and is a little village near Fontainebleau which was the site of the US military base where Caron’s father worked. Many of the US military personnel were housed in Bourron-Marlotte. Caron had not returned to France so this was her chance to see the village where she and her parents lived. We planned the trip to Bourron-Marlotte. We started out around 9h30. All went well and by approximately 11h15 we were standing at the Bourron-Marlotte Gerz train station with no taxis in sight. Phil talked with a man and found out that it was about a 15 to 20 minute walk to the center of Bourron-Marlotte. The man was Portuguese and was very helpful. We also talked with the train station attendant and got the same direction. So we took a walk into Bourron-Marlotte. We walked past farm fields, past horses and donkeys, and past the entrance to the Château Bourron estate. We will have to save that for another day. Our first stop was at a brasserie called Le Martingo. We got some soft drinks and had a nice rest in the shade. Then we started walking again. We were headed for 151 Rue Général Leclerc. Leclerc was a hero of the French army in World War II. The street we were on was Rue Général De Gaulle. De Gaulle was the leader of the French army in World War II. He later became president of France. The map showed us that Rue Général De Gaulle turned into Rue Général Leclerc in the middle of town, so we were headed the right way. Our walk took us past the local Office de Tourisme where we stopped in and checked our directions. A few minutes later we came to the address 151 Rue Général Leclerc. The house Caron had lived in had been torn down. She already knew this from viewing the location on Google Maps. The house had been replaced with a modern looking home from perhaps the 1960s. There is a high wall and high shrubs around the house and little could be seen. We could see through a window in the house that someone was home. A small cow bell was hung on the gate and Caron rang it a couple of times, but the person in the house did not seem to hear it. So after a few photos we headed back to the restaurant for lunch. We had a very nice lunch at the Le Martingo. By this time it was 15h00 so we headed back to the train station. We got back to the hotel around 17h30 without any excitement. The plan today is to visit Notre Dame in the morning and then figure out the afternoon while eating lunch. As usual the line to get into Notre Dame was quite long. Sandy guided Caron and Donna through the process, but did not accompany them into Notre Dame. She and Phil kept busy people watching by the statue of Charlemagne until Caron and Donna returned from their visit. With all of Paris to see and just a few days to get it all in, we decided to investigate one of the hop on hop off bus tours, Big Bus. We ended up purchasing the two-day Big Bus ticket which included a Seine boat ride. So for the rest of the afternoon we took the Big Bus around Paris. It was actually quite nice. Each person was given earphones to plug into the audio description of the sights. They had about 8 languages covered. Today we will use the Big Bus to get us to the Arc de Triomphe. It was fun taking the bus again and we did not have to wait long to get into the Arc de Triomphe. The only issue was that while we thought there was an elevator we could not find one. We ended up walking up a +300 steps to the top of the Arc de Triomphe. It is a wonderful sight to look out over Paris and the massive roundabout below. After the Arc de Triomphe we walked down the Champs-Élysées to the Cafe George V. We got an outdoor table and had a nice lunch. 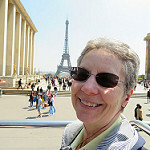 We returned to the Big Bus stop by the Arc de Triomphe and saw more of the city. At 6h30 we took a taxi from the hotel to PARISCityVISION at 2 rue des Pyramides for our day trip to the D-Day memorials in Normandy. Our tour took us to the following locations in Normandy. It was a very interesting tour and very emotionally moving. We returned to the hotel at 21:30 that evening. Today is PARISCityVISION Skip the Line Tour of the Eiffel Tower. We took a bus to the Eiffel Tower area and walked around until we found the meeting place for our tour. The tour was not due to start until around 16h00. So we looked around and did some souvenir shopping. Around lunch time we stopped at a local restaurant and had a very nice lunch. The weather forecast was for afternoon showers. As the day progressed the sky got more and more overcast until it was a dark gray. As we started out with the tour group it became pretty dark and started to sprinkle. By the time we got to the second level of the Eiffel Tower it had started to rain. Rather than stay at the second level we took the elevator to the Summit. Here it was really raining hard and small hail was accumulating on the floor. So we were at the top of the Eiffel Tower in a thunderstorm. We still managed to look around the Summit level. We got to see more storms coming our way which was quite interesting. We eventually found the Champagne Bar at the Summit and had a flute of champagne to celebrate. Then back to the ground level. It continued to rain as we walked toward what we thought was the nearest bus stop. It was close, but it was also not operating due to road construction in the immediate area. So we headed to the next stop, but that was about 10 minutes away. By the time we arrived there we were pretty wet. At least the temperature was in the 70’s F.
The bus ride home was interesting. By this time it was around 17h30 and there was a lot of traffic. The bus got caught in a traffic jam at the Opera. We were stopped there for almost 20 minutes. A tour bus from Italy was trying to go the opposite direction and the driver was getting frustrated. Twice he got out of his bus to direct Parisian drivers to move their cars in an effort to unblock the jam. Caron saw another Parisian directing traffic. He was NOT a policeman. Rather than going to the hotel to dry off, we walked towards the hotel and headed to the Abradavio restaurant for dinner. We even ate inside the restaurant to try to warm up from being so wet. We had intended to take our Seine boat ride after the Eiffel Tower tour, but with the rain it was a washout. So today is the day to do some laundry. Donna and Caron were going to explore the Opera area which was near the hotel. Sandy and Phil had made plans to visit their friends in Chennevières-sur-Marne a suburb of Paris. To get to Chennevières we took the Paris metro line 7 from Cadet to Opera to take the RER A train to Chennevières. We were early for our 14h30 visit to our friends apartment, so we had lunch in a very nice restaurant near the train station. According to the map, we had about a 20 minute walk to our friends apartment. Unfortunately the map did not indicate that much of the walk was straight up the side of the valley created by the Marne River. So after a 40 minute breathless walk we found our friends apartment. We had a wonderful and emotional visit with them. It was well worth our time to get to Chennevières. We took a cab to the Paris Gare de l’Est for our train to Strasbourg. Unfortunately our train was a victim of the labor strikes being held by the SNCF (French state train company) workers. We were able to get on the next train and had to just spend a couple of hours in the train station waiting. We had a short 10 minute walk from the train station to our hotel. For dinner we went to an interesting Alsace restaurant called L’Ami Schutz (Friend Schutz). As has been the pattern in the past when flying to Europe, Phil has always developed a sinus infection a few days after arriving. So, today is the day the sinus infection really set in and disrupted his stay. Sandy took over the translation, navigator and tour guide duties that she had shared with Phil. So while he stayed in the hotel room, Sandy, Donna and Caron toured hot Strasbourg. Strasbourg is in the Alsace department in eastern France. Alsace has bounced back and forth between France and Germany for the last few hundred years. It is very close to Germany, only separated for it by the Rhine River. But being this far east it is affected by continental air masses which come in from Germany, Poland, Russia, etc. So the weather is often hot and humid in the summer. And so it was during our visit. The ladies walked through an outdoor market featuring ready to eat food, fresh vegetables, fruit, cheese, and meat. They inquired at the tourist office about visiting the Strasbourg Notre-Dame Cathedral and the astronomical clock, and a boat ride on the river Ille. They took a “petite train ride” learning about the area, and “Petite France” the historic part of Strasbourg. We bought our lunch at the French department/grocery store Monoprix and took it back to the hotel to eat. We had reserved a half day wine tour while still in the USA which was scheduled for the afternoon. Donna, Caron, and Sandy met the tour guide and two other Americans in front of the post office. They enjoyed 4 hours of driving through the Alsace region, stopping at two family run vineyards and sampling 4 or 5 different varieties of wine at each location. Phil, rested in the hotel. Phil is still not feeling well, so the ladies are on their own again. Today the temperature was 29 C – very hot!! The ladies walked to the Strasbourg Cathedral to reserve spaces for the astrological clock presentation at noon. Reservations are only available each morning until space is sold out. Sandy relied on her French to ask questions and make reservations. She thanked the lady at the Cathedral for speaking slowly and clearly. Her practice all winter on Duolingo French (a language app) had helped. After making the reservation for the clock, they walked to the Batorama boat tour office. They reserved spaces for the 15h00 tour that afternoon. There was a flea market going on so they walked through all of the tables and looked at everything. Then it was time for the noon astrological clock presentation which was very interesting. Sandy left Donna and Caron on their own for lunch so she could check on Phil back at the hotel. She again purchased lunch at the Monoprix while Caron and Donna ate burgers and fries at a cafe. The boat ride in the afternoon was on an enclosed, air-conditioned boat with glass sides and ceiling. It sailed by the European Capital building and many other interesting places. Up early to walk to the Strasbourg train station for our train to Saint-Malo. This train ride was pretty uneventful. Our Strasbourg train took us to Rennes and from Rennes transferred to another train for the last hour to Saint-Malo. The biggest problem on this leg of the journey was the lack of taxis at the Saint-Malo train station. When we got to our building at 4 Rue de la Coudre in the Intra-Muros part of Saint-Malo we found Monsieur and Madame Roussel waiting for us. We had rented the Roussel’s ground floor apartment for Bill and Caron. So now Caron and Donna were able to use the apartment. Phil rested and the ladies enjoyed dinner at one of the local restaurants on the Place de Marché aux Legumes. Sandy went early in the morning to get Phil a doctor appointment at 11h15. The doctor was impressed with the severity of Phil’s sinus infection and prescribed mass quantities of antibiotics and vitamins. A visit to the pharmacist completed his morning. Sandy, Donna, and Caron took a city bus to the Intermarche grocery store. We bought items for breakfast, lunch, and essentials. Sandy, Donna, and Caron shopped for fruit at our neighborhood market. Sandy was glad to see Monsieur Alix, vegetable and fruit vendor, and he recognized her immediately. They took a city bus to the Saint-Servan Rosarie to look at the beautiful rose garden. Then they walked down hill to the marché to buy meat. The butcher and his assistant were glad to see Sandy and they asked about Phil. Next Sandy took Caron and Donna to the Condor Ferries office to see about visiting the Channel Island of Guernsey. They were able to reserve spaces and a hotel for Friday night, returning at 9:30 pm Saturday. The ladies toured the Saint-Malo castle museum and walked out on the sand at low tide towards Fort National island. In the afternoon Phil felt well enough to accompany them on a bus ride to the La Cite d’Alet. It poured rain on the bus ride but the sun came out by the time we arrived and it was a lovely afternoon. We walked on top of the Alet which has a the German bunker with a museum. The walk on the Alet goes past 6 German at the military pillboxes, each pillbox weighs 47 tons. The wonderful ocean views are in contrast to the military relics. It was a long walk home but we stopped at a beach cafe for ice tea and lemonade before returning to our apartment. The ladies wanted to take an Island cruise on the Corsaire ferry but found out it wasn’t available until 4:30 pm. So, they took the boat across the bay to Dinard. They walked through the market, admired the 4 story bell epoque mansions, cliffs, and had lunch at a beach cafe. They took the ferry back in the afternoon. Donna and Caron took the Condor Ferries ferry to Guernsey for an overnight stay on the Channel Island. Phil and Sandy took the bus to the Intermarche for another grocery store trip. Phil and Sandy took the bus to Paramé to shop at the market for meat. The butcher and his assistant were glad Phil was feeling better. Donna and Caron returned from their trip to Guernsey. The ferry arrived a couple of minutes late at around 21h00. We met them at the ferry terminal and walked them back to the apartment. The reports from Guernsey were good, including a high tea, a nice hotel, and a visit to a castle. We went to lunch at the Hotel Brasserie Armoricaine. The Armoricaine is a traditional French restaurant. White table cloths, old-fashioned decor, traditional Sunday menu and a professional wait staff. We had a very nice lunch as we always have had in the past at this restaurant. Sandy joined Donna and Caron for lunch and some tourist shopping. Back at the apartment Phil made meatballs. We had Donna and Caron over for dinner this evening enjoying the meatballs with spaghetti. We all took a taxi at 9h30 to the train station. Caron and Donna’s first leg of the trip back to CDG was on the local Brittany TER train. That train would take them to Rennes where they would get on the SNCF TGV train for the trip to CDG. Later in the day Caron called from their hotel at CDG. They didn’t have any problems getting on the second train in Rennes. However they got lost in the train terminal at CDG. They went up and down escalators and asked for directions. The escalators are hazardous with luggage and you can easily lose your balance. Caron fell down the escalator with her luggage landing on top of her. Donna yelled for help and another traveler stopped to help them up. They finally made it to the hotel and were ready for a rest. Caron was a bit bruised but a trip to the hospital was not needed. Caron and Donna left France almost two hours behind schedule. Apparently there were weather related delays at CDG. They were flying WOW airlines to Reykjavik with a connecting WOW flight from Reykjavik to Chicago. WOW airlines got them on the flight to Chicago and they landed at Chicago O’Hare Airport a couple of hours late. But they made it! A special note should be made that according to Caron’s Fitbit, Sandy, Caron and Donna walked around 5 miles each day in France! So ends the three week soujourn of Caron and Donna. Well done!